This silicone pendant is a great gift for all young girls. 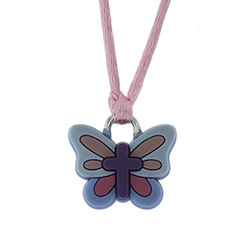 The pendant comes on a 24 adjustable lace cord and features a butterfly and cross on the front and 2. Cor. 5:17 on the back. 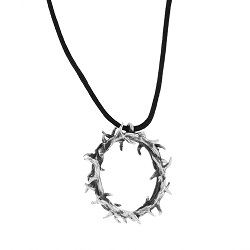 Made from the finest sterling silver and features a detailed Crown of Thorns design. Comes on a 20 inch cord. 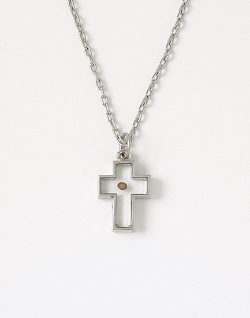 Made from sterling silver, this necklace features a filigree design with a cross and a heart. Comes on an 18 inch box chain. 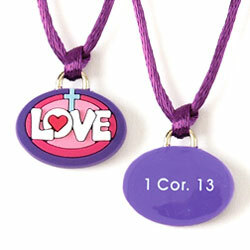 3/4H x 3/8"W.
This silicone pendant is a perfect gift for young girls. 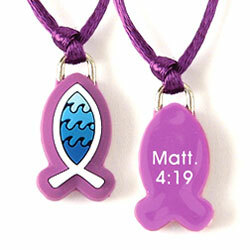 The pendant comes on a 24 adjustable lace cord and features a fish shape with Matt. 4:19 on the back. 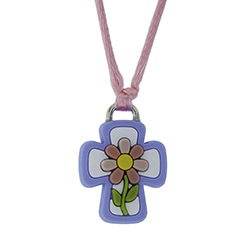 This silicone pendant is a great gift for all young girls. 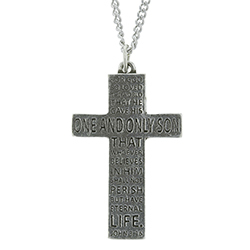 The pendant comes on a 24 adjustable lace cord and features a cross and flower on the front and John 3:16 on the back. 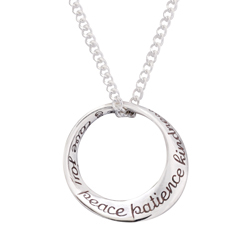 Love, joy, peace, patience, kindness, goodness, faithfulness, gentleness, and self-control are each inscribed on this delicate Fruit of the Spirit pendant. 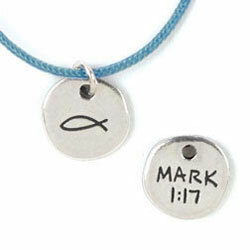 This design is handcrafted with sterling silver and comes on an 18" curb chain. 5/8" x 5/8". Made in the U.S.A. 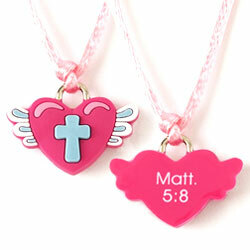 This silicone pendant is a great gift for young girls. 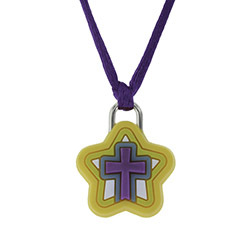 The pendant comes on a 24 adjustable lace cord and features a star and cross on the front and Col. 1:16 on the back. 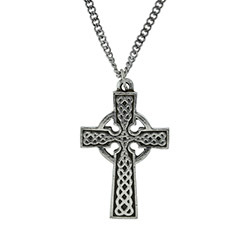 You'll love the delicate intricacy of our Traditional Celtic Cross Necklace. 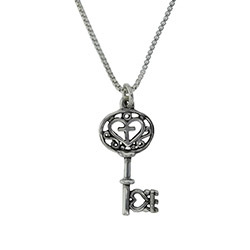 It is made from 100% lead-free pewter and features a ringed cross with a celtic knot design. 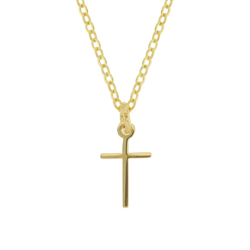 It comes on a 24-inch adjustable chain.Dimensions: 1 3/8"H x 1"W.
This two-tone cross necklace features a gold tone angled cross with a beautiful silver tone swash. 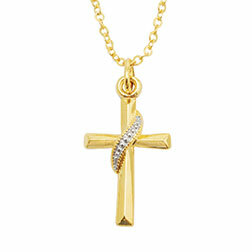 Our two-toned Christian jewelry designs are handmade from 100% lead-free pewter and then triple plated in 22Kt gold and rhodium. It comes on an 18" cable chain. Dimensions: 7/8"H x 5/8"W. Made in the U.S.A. 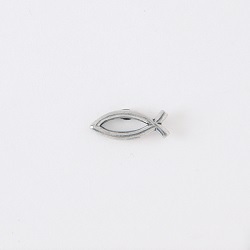 This lapel pin features a cylindrical open Jesus fish. Our gold plated lapel pins are handcrafted from 100% lead-free pewter and then dipped in 22kt gold. 1/4" H x 5/8" W. Made in the U.S.A. 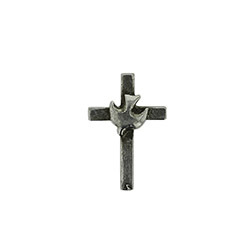 This lapel pin features a descending dove in the center of a cross and is an elegant way to share your faith. Our gold plated lapel pins are handcrafted from 100% lead-free pewter and then dipped in 22kt gold. 9/16" H x 3/8" W. Made in the U.S.A. 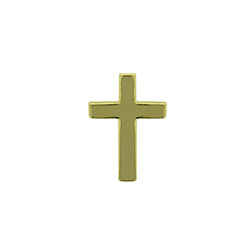 This lapel pin features a simple cross and is a classic way to share your faith. Our gold plated lapel pins are handcrafted from 100% lead-free pewter and then dipped in 22kt gold. 9/16" H x 3/8" W. Made in the U.S.A. 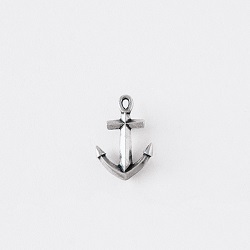 This lapel pin reminds Christians to be anchored in Jesus. Our lapel pins are handcrafted from 100% lead-free pewter. 11/16"H x 1/2"W. Made in the U.S.A. 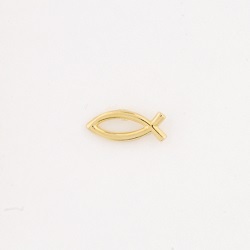 This lapel pin features a cylindrical open Jesus fish. Our lapel pins are handcrafted from 100% lead-free pewter. 1/4"H x 5/8"W. Made in the U.S.A. 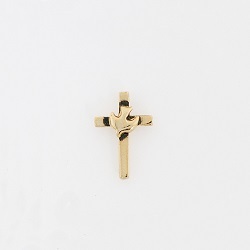 This beautiful lapel pin features a fleur cross with a cute heart in the center. Our lapel pins are handcrafted from 100% lead-free pewter. 5/8"H x 7/16"W. Made in the U.S.A. 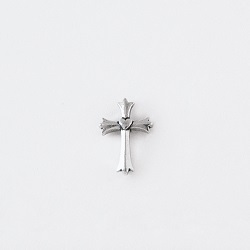 This lapel pin features a descending dove in the center of a cross and is an elegant way to share your faith. Our lapel pins are handcrafted from 100% lead-free pewter. 9/16"H x 3/8"W. Made in the U.S.A. 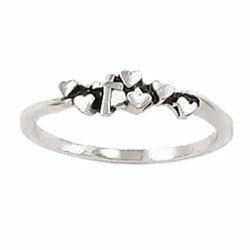 This solid sterling silver ring features a cross surrounded by hearts. The standard-fit band is 2mm wide. Made by Bob Siemon. 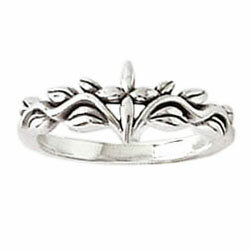 This solid sterling silver ring features a starpoint-tipped cross center flanked by a leafy vine.